The code of Sportexx is lean and extensible codebase will allow you to easily add functionality to your site via child theme and/or custom plugin(s). users to add Brands to their products. Size and Color custom taxonomy. Here is a quick look about the theme and its features. 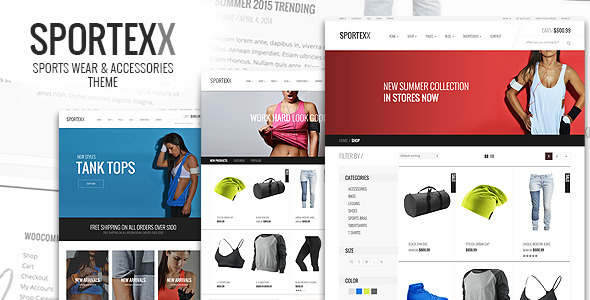 Sportexx is a clean, modern, flexible WooCommerce theme designed and coded specifically for Sports, Fitness and Gym kind of stores. Sportexx can be customized easily using Redux Framework and Customizer. It has a powerful theme options panel via Redux and can easily integrate most of its options with WP’s native Customizer. The theme also bundles custom tailored version of revolutionary Visual Composer which allows users to build various page layouts with minimum effort. Translation Ready – comes with .pot file which can be easily translated using a poEditor. Sportexx is very nicely integrated with WooCommerce and provide lot of additional features. Can display product items in 6 different ways. Fixed an issue with nav inverse on dark BG.